the winter is not yet completely over in here. Even though we had a few days that felt like real spring still now it is cold and unwelcoming outside. One more reason to stay in the office with a cup of tea and a screen full of Factorio code. During the 0.11 stabilization process we have played quite a bit of Factorio on our ongoing dev map. 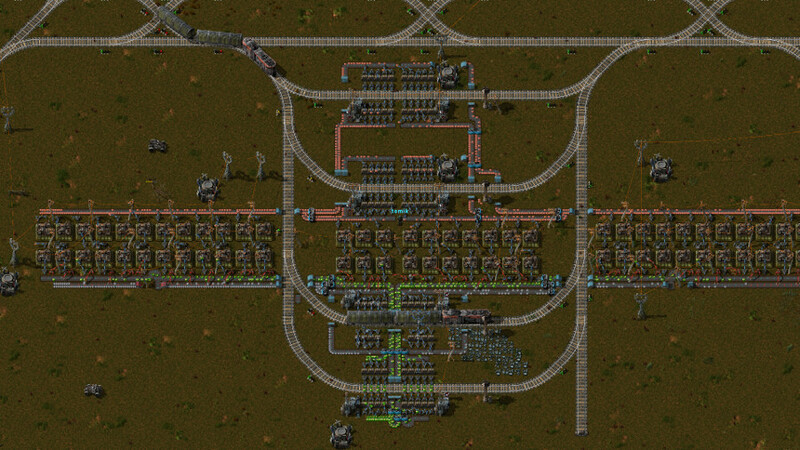 The map contains a combination of many concepts: standard logistic setups, robots, heavy use of blueprints, relatively large rail network, etc. There is not much special about the map but still we would like to share the map with you guys. So you can download the save from our forums or have a look at one of the screenshots below. That would be our train ore storage area with ways for in and out. Actually here comes a fun fact. We have had quite some issues with our ad-hoc train system so in the end we took inspiration from train setups posted in our forums to build kind of scalable system which can handle many trains without jams. The map is also not really huge but already now and then the game lags. Kovarex did some profiling and there is no single obvious cause for that. Rather there are multiple places where we can save a bit of processing time. The items movement on the belts could be further optimized as well as train movements - there is a lot of repetitive sin / cos calculations in checking their collision boxes. Oh and the smoke =) Updating the smoke coming from the train locomotives is actually starting to take noticeable amount of time (there is just too much of it). These are some known candidates for optimizations. The plan is to squeeze some of these in 0.12 if possible. With working multiplayer the need for performance is even bigger than before. Yesterday we have released the 0.11.18 and so far it is looking rather good. The plan is to have 0.11.19 as the stable candidate. It took an enormous amount of time but on the other hand the multiplayer is actually quite playable even over the internet (the target was to have a "rough MP" over LAN). Naturally we are slowly starting to work on our list for the 0.12. Kovarex will be in charge of implementing the endgame content. Now he started with some internal refactoring to facilitate having multiple "surfaces" on a single map (surface of the earth and the space surface with the space platform). Actually this refactoring could come really handy in the future with expanding to other worlds, going underground, etc. all as a part of a single game while the simulation of your home factory is running. I am now taking some time to do updates on the website. Namely in our payment and deployment system. One of the things on the list is to move from using amazon s3 to dedicated virtual servers which should speed up the downloads a fair bit. Cube is finishing with our automatic release server and Robert is going to integrate the silo and rocket animations (which look really great btw.). The graphics guys are still immersed in research of new entities for the endgame content. Our theme art is getting rather obsolete. We are aware of it and we would like to change it. Recently, we have been contacted by Leon, a freelance concept artist from the Netherlands. We have invited him to spend couple of days with us here in Prague. We had a good time working together so we agreed on cooperation on a series of new theme pictures telling the story of the game and giving a fresh view of the Factorio world. This is just the beginning of the work that will probably take some months because Leon still has some school stuff to do. However we wanted to let you know that we are looking after other areas of Factorio ecosystem than just the game itself. As usual let us know what you think at our forums.